(Matthew Cavanaugh for The Boston Globe) Jeremy Kislus is seen assembling a handgun at the Smith & Wesson plant in Springfield. Smith & Wesson plans to invest in the plant and add 225 jobs, aided by $6 million in tax incentives the state approved yesterday. The state approved $6 million in tax incentives for Smith & Wesson Holding Corp. yesterday to help the gun maker expand its Springfield headquarters and manufacturing plant. The company said earlier this month it would add 225 jobs at its massive 50-acre Roosevelt Avenue facility in Springfield, where it plans to shift production of its Thompson/Center Arms line of hunting rifles from New Hampshire. The Springfield plant already employs roughly 900 workers. “This is a big, big expansion for Western Massachusetts,’’ said Greg Bialecki, the state’s secretary for housing and economic development. Smith & Wesson, one of the world’s best-known producers of guns and handcuffs, acquired Thomson/Center for $102 million four years ago. Declining sales prompted the company to trim its workforce in New Hampshire last year, and to shift the manufacturing to Massachusetts. The company, which lost money last quarter, said it expects to start moving the production line next month and finish around July, at a cost of about $6 million. Founded in 1852 by Horace Smith and Daniel B. Wesson, Smith & Wesson makes a variety of rifles, shotguns, pistols, and equipment for hunting, law enforcement, military, and other uses. Executives predicted it would generate between $405 million and $425 million in sales in the fiscal year ending in April, less than expected after a surge in demand last year. 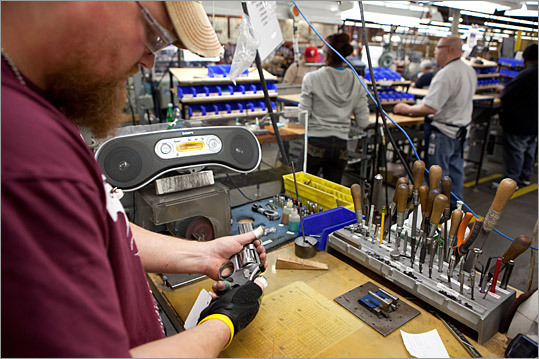 Although some workers will likely relocate from New Hampshire to Springfield as part of the consolidation, Smith & Wesson expects to fill most of the jobs with new hires, including managers, skilled machin ists, and support staff, the company said. The average worker will earn $30,000 to $40,000 per year, although some jobs will pay as much as $165,000 per year. The $6 million in tax breaks, which will be spread out over seven years, work out to nearly $27,000 per job and form the second-largest incentive package the state has awarded this year. The state recently reconfigured its tax incentive program to steer more money to manufacturers and other companies with significant out-of-state sales, and to give preference to businesses expanding in poorer cities such as Springfield. Smith & Wesson officials said the incentives helped persuade them to expand in Springfield, despite approaches from other states. Bialecki said he was told the company had also considered consolidating its operations in other states where it has facilities, including New Hampshire and Tennessee. In exchange for the incentives, Smith & Wesson also promised to invest $63 million in its Springfield operation over the next five years. Company lawyers said the firm has requested a property tax break from the city of Springfield, but the decision to move the production line there does not depend on receiving those incentives. “We are committed to Springfield,’’ said company attorney Melinda Phelps. The state Economic Assistance Coordinating Council also voted yesterday to give final approval to a $552,132 local property tax break for an office building in Worcester, and to end incentives for 38 companies early because the firms did not create the jobs they promised or did not comply with other requirements of the program. Todd Wallack can be reached at twallack@globe.com. Smith & Wesson has been making firearms since 1852.